Google has provided a new way to boost the security service of Gmail by adding notifications for Gmail that will warn you against any suspicious URL when you are trying to open it. Few days back, we published an article where Stagefright hack could exploit an Android device in less than a minute, just with the aid of URLs sent by mail clients. You can read the article here. Hence, as a security measure against the suspicious URLs, Google has integrated the new notifications for Gmail that will provide you waning ig Gmail finds it suspicious. Gmail has a huge user base of more than a billion users. Hence, the company is strongly focusing on safe browsing. When users will try to click any link or URL that is detrimental to the safety of their device, the Gmail client will display a warning message as a full page notice, so that the warning doesn’t go unnoticed. The company is expanding its ‘safe browsing’ security notifications, which warn users when they are about to open suspicious links contained within emails, so that they show before the link has opened and as a full-page notice. Previously the warning would display before a link was clicked, but with greater prominence post-click Google hopes to cut down on users actually visiting malicious sites. “The users that receive these warnings are often activists, journalists, and policy-makers taking bold stands around the world,” Google said in a blog post. Apart from this feature, Google is concentrating on ameliorating the encryption in emails, features that are important for activists and persons or organizations which can be susceptible to hacking and surveillance. 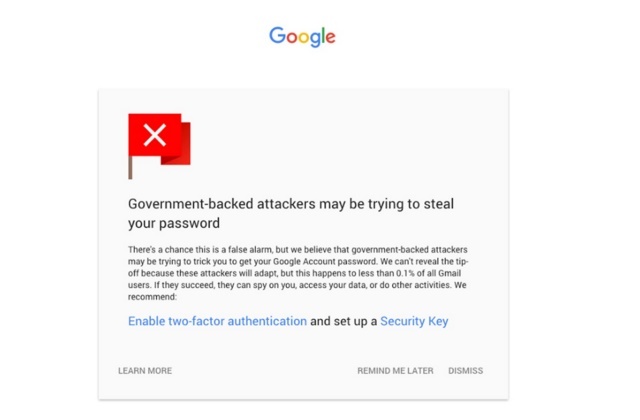 The notifications for Gmail will also contains suggestions to adopt two step verification process that can provide you safety against attacks. The new feature will still take some time before making to users, and Google is right now geared up to leverage the encryption system in Gmail. “We’re very encouraged by this progress! Given the relative ease of implementing encryption and its significant benefits for users, we expect to see this progress continue,” Google said.